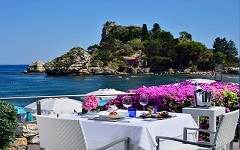 Enjoy your stay at La Plage Resort, one of the best wellness hotels in Taormina. Overlooking the bay of Isola Bella, immersed in a true natural paradise, a new oasis of beauty has born, the Expure SPA, one of the best wellness hotels in Taormina. It is an exclusive ambience where our guests can rebalance their own physical and mental well-being. DECLEOR, a trade mark, which needs no introduction in the international wellness arena, with their know-how, will turn each treatment into a memorable experience. The technique of our treatments of La Plage Resort, one of the best wellness hotels in Taormina, is based on timeless principles, where functionality blends with experience and working in synergy with trace elements, oils and pure antioxidants, will provide our guests a profound sense of well-being and tranquility. Set in a secular pine forest and facing the Ionian sea, the Resort is a lifestyle haven for devotees of peace, nature and sea. With careful attention to detail, the Resort provides contemporary atmosphere and minimalist furnishing in every room and public space.